Guillaume Faye was one of the leading thinkers of the French New Right in the 1970s and ’80s. After departing in 1986 due to fundamental strategic disagreements, Faye had a successful career on French television and radio. He returned to the stage of political philosophy and activism with the publication of Archeofuturism (also available here ) and its companion volume Why We Fight, now finally available in English. 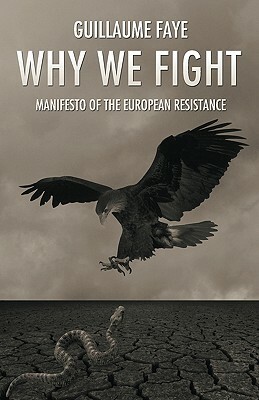 If you read one book by Guillaume Faye, Why We Fight should be that book, for it summarizes all the essential ideas of his other books and offers a vision of, and a call to, European rebirth. Faye’s goal is to unite whites on the basis of “clear ideas” against a “common enemy.” For Faye, the enemy is the colonization of Europe by non-whites under the banner of Islam. To provide the necessary clear ideas, Faye devotes a good portion of Why We Fight to a “Metapolitical Dictionary” in which he defines 177 key terms in crystalline essays and aphorisms. Topics discussed include race, eugenics, destiny, ethnomasochism, xenophilia, Eurosiberia, neo-paganism, Christianity, populism, democracy, elitism, progress, tradition, values, ecology, the philosophy of history, individualism, hierarchy, and nationalism. Once you read Why We Fight, you will never think of politics the same way again.